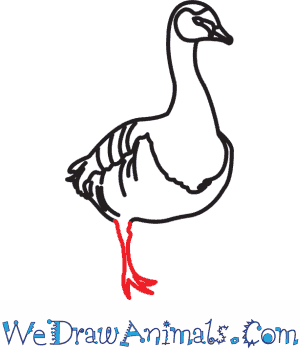 In this quick tutorial you'll learn how to draw a Barnacle Goose in 6 easy steps - great for kids and novice artists. 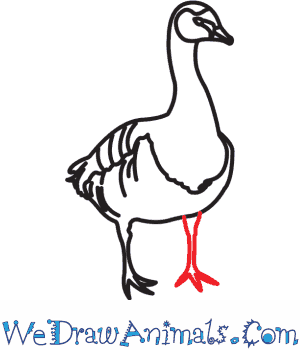 At the bottom you can read some interesting facts about the Barnacle Goose. 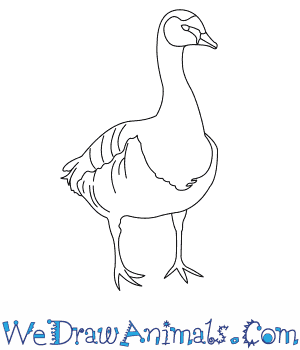 Step 1: The Barnacle goose has a small rounded head. Draw an arching line that comes to a point for the bill and curves parallel to the beginning of the head. 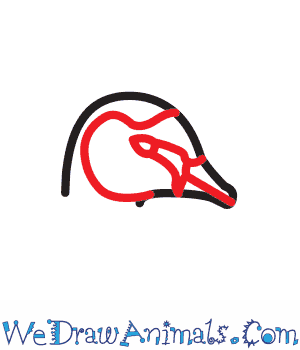 Step 2: Create the face by drawing a small circle for the eye that connects to a line reaching to the tip of the beak. 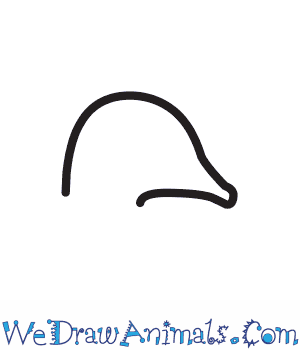 Separate the beak from the rest of the face by drawing a small curved line. 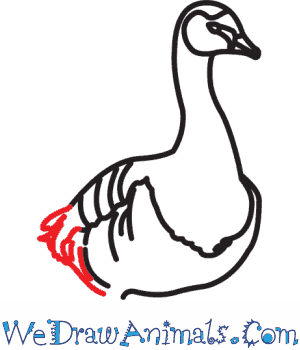 Give your goose a white face by drawing a curved line that nearly touches the back of the head and connects to the top and bottom of the face. Step 3: Now, using two long lines that connect to the base of the head and curve away from each other you will make the plump, round body of the goose. Add feathers by drawing lines as seen in the picture. Step 4: Draw the short, fluffy tail by using small rounded lines that connect to one another at the back of the body. Step 5: For the leg, draw two skinny lines that come from the area where the tail begins. Connect the two lines with three points for the foot of the goose. 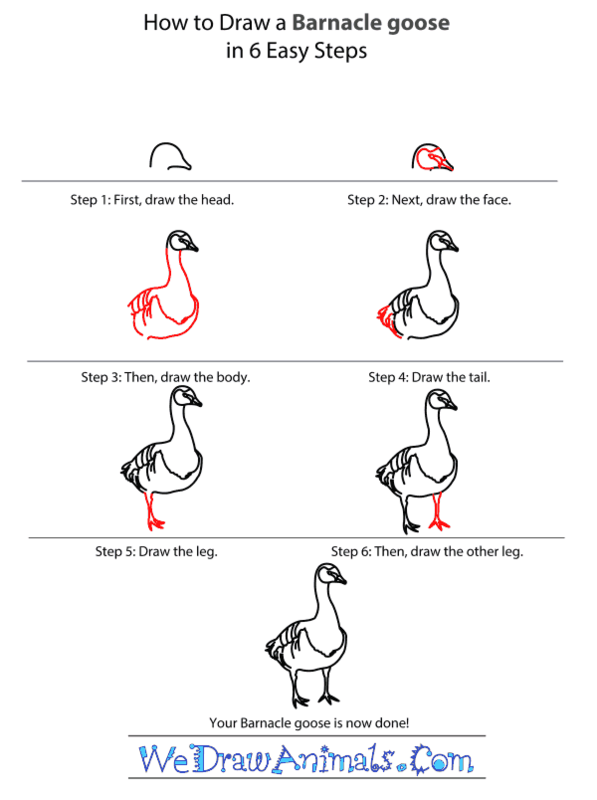 Step 6: Draw the second leg in the same way and add color to your goose to bring it to life. Use your lines to guide where the color should change or stay the same. The neck, chest, and back is black and the rest of the body is light grey or white. The Barnacle goose is in the same family of ducks and swans. There are four main populations that live in Greenland, the island of Svalbard, Russia, and the islands of Novayamlya. This goose often lives in pasture land, salt marshes, and grassy fields near the coastal regions. They range in weight from 3.08 to 4.85 pounds (1.4 to 2.2 kilograms) and can grow as long as 21.65 to 27.56 inches (55 to 70 centimeters). Their wingspan is from 51.18 to 57.09 inches (130 to 145 centimeters). Barnacle geese breed once per year in the spring, and they lay about three to six eggs per season. This bird is herbivorous and eats mainly grass, agriculture crops, or aquatic vegetation. Barnacle geese form lifelong and monogamous mating partnerships. The eggs usually take 24 to 26 days to hatch. The arctic fox is one of their predators. Female Barnacle geese build their nests in rocky areas on hillsides. The Barnacle goose has a lifespan of 18 to 25 years. Lesson plan note: Visit your local duck pond and observe the variety of ducks, geese, and swans. Bring a field notebook and have the children draw all the different birds that they find. 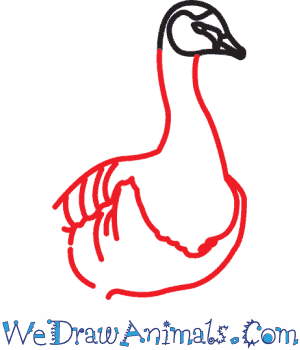 Next to each bird drawing, have the children write down unique characteristics. Have the children share their observations with the class.